Rock climbing in Ramanagara is an activity every adventure buff should try. Located just about 50 km from Bangalore, Ramanagara is a very popular rock climbing destination in Karnataka. The town is also a very famous silk production center in the country and is therefore also called as Silk Town. The landscape of the region is beautiful, covered with numerous hills and lush greenery. The rocks in Ramanagara are majorly granite rocks, which is the most preferred type among Indian climbers. On the rock climbing grading scale, Ramanagara is usually placed in the moderate to difficult grade. The place is recognized as an international rock climbing site. You should ideally avoid the monsoon season, between the months of July to October. This is because the rains in the season will result in the rocks getting wet and slippery, making rock climbing a very risky activity. The best times to visit will be the months between October and March when the sky is clear and the rocks are dry and easier to get a foothold on. You will also need to get a clearance for rock climbing in Ramanagara from Regional Forest Office located in the Ramanagara Town. A fee will be charged. The office is only open on weekdays. So, if you are planning for a rock climbing trip on the weekends, make sure you get the permit well in advance. The rocks are cleared for activities from 6 AM to 6 PM. An interesting fact about the rocks of Ramangara is that it was the setting for the Bollywood movie Sholay. As such, people flocked to the place after the release of the movie, which resulted in some of the rocks being nicknamed after characters from the movie, including one which is called Kalia. 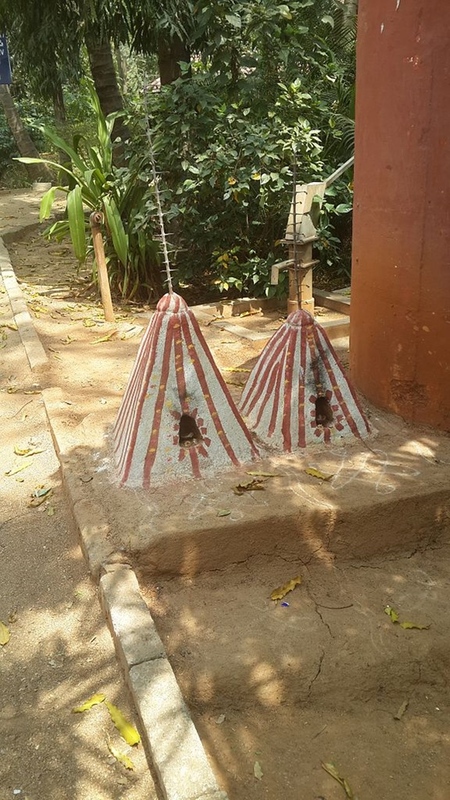 In fact, Ramadevara Betta itself is also known by the name ‘Sholay Gudda’. 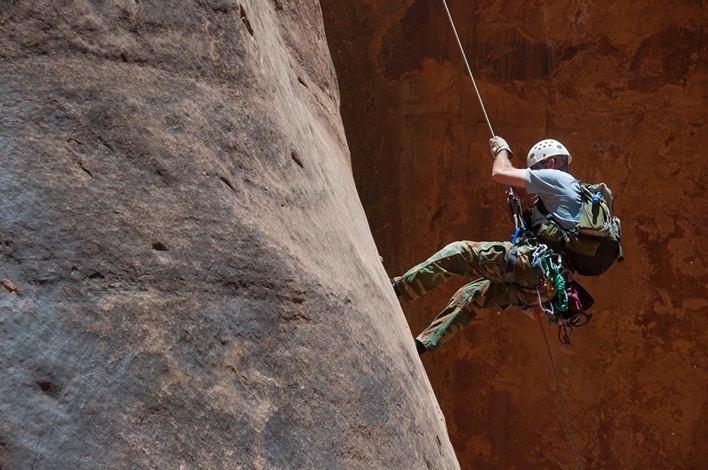 The place is also ideal for rappelling. Other popular rock climbing spots in the region include Shivaramagiri, and Kapotagiri. 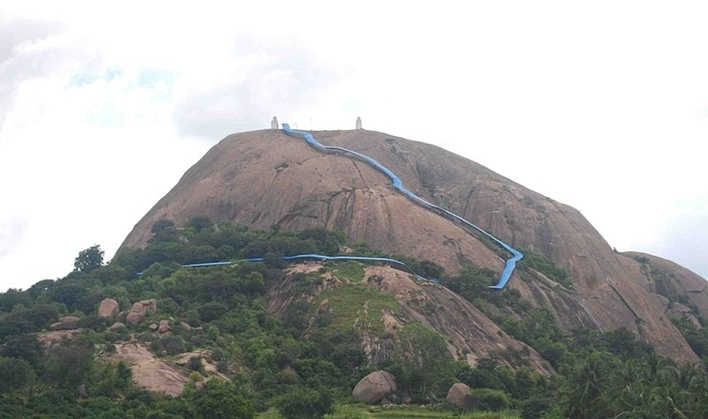 Among the many hillocks which are suitable for rock climbing, the Ramadevara Betta is the most popular one, rising to a height of about 747 meters. A popular legend says that Lord Rama visited the place after his exile from Ayodhya. This is an ideal rock for beginners and those who are looking for a short climb. However, there are also many bolted routes available that should easily satisfy all kinds of climbers. Just take an extra precaution when using routes which look too old since they may not have been properly maintained due to their sparse usage. Visitors can either opt for bouldering or pitch climbing. While bouldering is advised for beginners, pitch climbing is suited for experienced climbers since it involves scaling rocks which are more than 30 meters in height. Some of the popular climbs at Ramadevara Betta include the Rainbow, Anna Thamma, and Wanakkal Wall. Atop the hill, there is a temple dedicated to Lord Rama, Hanuman, and Sita, with a small pond nearby. However, if you are not too keen on either bouldering or pitch climbing, you can opt for an easier activity – chimney climbing. This is a variation of rock climbing in which you squeeze through the small areas of the rock structures to get to the top. This usually involves less stress than rock climbing, and you can actually get good at this sport with a little bit of practice. You can also opt for trekking through the Revana Siddeshwara Betta (Revanasiddeshwara Betta), which will offer you a gorgeous view of the surrounding region. You will also see quite a few temples while trekking through the routes. The routes are steep in some areas, but overall the trek will be refreshing and pleasant. But keep in mind that the region is known to have numerous monkeys, which may turn out to be a nuisance in case you carry too much food. A very popular folk museum in Karnataka, the Janapada Loka was created with an intention to showcase the rich culture of the region. One of the sections of the museum, called the Loka Mahal, has about 5000 folk artifacts on display. You will also find folk dance and other performances at the place on most days. But an event that many people in the region look forward to is the Lokotsava, a two-day festival conducted during February-March, wherein folk artists from all across Karnataka come and deliver their performances. If you are heading over to Mysore from Ramanagara, then a visit to the Ranganathittu Bird Sanctuary is a must, especially if you are interested in bird watching. 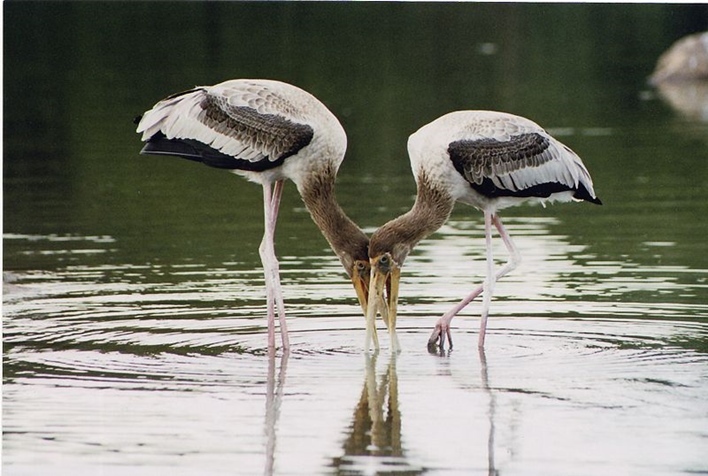 With an area of 40 acres, it is the largest bird sanctuary in the state of Karnataka. 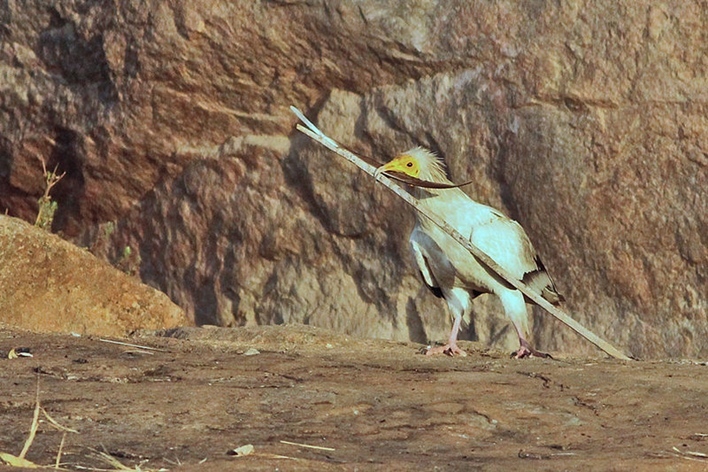 The sanctuary is estimated to house around 170 species of birds, with the peak winter season attracting more than 40,000 birds. The place is visited by nearly 300,000 tourists each year. If you are fond of arts and crafts, Channapatna is the best place for you. Famous for its wooden toys, the region is also called in the native tongue as ‘Gombegala Nagara’, which roughly translates as ‘Town of Toys’. There are many tiny cottage industries in the region which will give you a glimpse into traditional crafts of the place. A popular place to visit in Channapatna is the Bharath Art And Crafts, where you can observe skilled craftsmen creating various toys, decorations, and other such items. About 350 hectares of land at the Ramadevarabetta has been reserved as a sanctuary for vultures. This was done to protect the large number of long-billed vultures which reside in the region. So, if you have any particular interest in vultures, an exploration at the sanctuary should quench your curiosity. Plus, you might even spot sloth bears if you are lucky. This is the spot where two of Karnataka’s famous rivers, Kaveri and Arkavati, meet. The place is surrounded by lush greenery and makes for an ideal picnic spot. The river Kaveri flows in a deep gorge for about 3.5km. You can walk along the gorge to explore the region further. Plus, the surrounding hills provide a very scenic view. And if you are interested in some fishing, there is the Galibore Fishing Camp just close by. This is an artificial reservoir created by damming the River Kanva. Located approximately 10 km away from Ramanagara, the Kanva reservoir is a popular attraction among tourists and is a good place to camp and hang out with your family or friends. It also offers fishing and bird watching opportunities. The Hindustan Airport at Bangalore is located approximately 46 km away. The Mysore Airport is at a farther distance of about 85 km. There is a railway station located in the town of Ramanagara itself. You can easily get a train to the station from all major locations in the state. Many buses are available to the location. And if you are visiting by car, get onto the old Bangalore – Mysore road to arrive at the Ramanagara town. And from there, it should be an easy drive to the rocks. Rock climbing in Ramanagara gives you an incredible experience. Just remember to carry your backpack, water bottle, first aid, a fresh pair of clothes and enough energy snacks to get yourself through the climbing activity.